When bone is inadequate for dental implant placement in the upper back teeth, the bone is grafted so implants may be placed. In most cases a bone matrix will be added into the sinus. The sinus is a hollow area in the upper jaw which is an excellent site for the addition of bone. Access is made inside the mouth and a bone matrix is added. 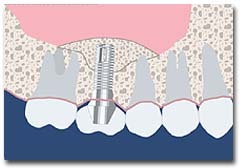 The area of the sinus grafting heals for 6-9 months, after which time the dental implants are placed. Bone that forms in the sinus after grafting can be stronger than your natural bone. This makes sinus grafting a preferred option when there is minimal bone available. Sinus grafting historically is a very predictable area to add bone. If you would like to know more about how we do sinus grafting, give us a call or schedule a free consultation today!